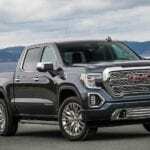 The 2018 GMC Sierra 2500HD – The Best, New Truck to Hit the Market This Year! When it comes to trucks, there’s no better manufacturer than the century-old GMC brand. With over one hundred years in the automobile business, and with some of the most highly lauded and sought after trucks on the market, you can trust that this brand can engineer a truck with some serious performance and style. Below we’ll take a look at the latest GMC truck to hit the market – the 2018 GMC Sierra 2500HD and show you why this is the best truck to buy in 2018. The 2018 GMC Sierra 2500HD is equipped with two available engine options: the 6.6 Duramax Diesel Engine, which delivers 445 horsepower and 910 lb-ft of torque, and the Vortec 6.0L V8 engine which delivers 360 horsepower and 380 lb-ft of torque. With a trailering capacity of 14,500 lbs, this is a truck that has the power and capability for any job or weekend getaway. If trailering is an important component for you than the 2018 GMC Sierra 2500HD won’t disappoint. This 2018 GMC truck comes with many trailering technologies including an available trailering camera system, which provides several vantage points and views for confident trailering, as well as an available gooseneck and fifth wheel package, which increases your trailering capacity to 18,100 lbs. In addition, this vehicle is equipped with a StabiliTrak System with hill start assist, which improves stability by preventing traction loss, and gives you extra time to switch from the brake to an accelerator when you’re on a hill. With all of these high-tech advantages, trailering is going to be a breeze with GMC’s latest vehicle. In addition, a truck isn’t a truck if it doesn’t have off-road capabilities. The 2018 GMC Sierra 2500HD includes off-road equipment like all-terrain tires, twin tube Rancho brand shocks, underbody shield, and off-road driver information center graphics. With four-wheel drive capability, this is a truck you can rely on to get you through mud and rain, rocks and wind, and the snowiest weather. The interior of the 2018 GMC Sierra 2500HD is indeed a sight to be seen. The interior of this GMC truck is decked out with black finishes, heated black leather seats, leather-wrapped steering wheel, and triple door seals that make for a supremely quiet cabin. With spacious seating, a large center console, and available under seat storage, this is a truck that you’re never going to want to get out of. It’s the 21st Century, so the engineers at GMC wanted to include some of the most high tech and futuristic features in the interior of the 2018 GMC Sierra 2500HD. This truck is equipped with an available GMC Infotainment System – an 8-inch touchscreen display that includes navigation, Bluetooth, Apple CarPlay and Android Auto, as well as a number of available apps and services. To get your really excited – this GMC truck also includes an available built-in WiFi hotspot as well as a wireless charging station in the center console. If that’s not enough, the 2018 GMC Sierra 2500HD also includes a BOSE premium audio system, and an available MyGMC mobile app. This mobile app allows you to locate your vehicle, remote start your engine, check your fuel, oil life, and air pressure, as well as send destinations to your MyLink system all through your smartphone. Trust us, you’ll take the long way home just to stay in this vehicle a little while longer. The engineers at GMC went all out with the exterior of the 2018 GMC Sierra 2500HD. The exterior of this high-performance truck has an aggressive edge with ultimate utility. The bed of the truck is made with high-strength steel and a spray-on bed liner, an EZ-lift and lower tailgate, upper tie-down hooks, a sculpted grille with chrome surround, and an available hood scoop. With a purposeful design, high strength utility, and the powerful performance to back it up, this is a GMC truck that’s going to be instantly recognizable for years to come. When it comes to safety, the 2018 GMC Sierra 2500HD has the high-tech features that make this one of the safest and most reliable vehicles on the market. This GMC truck includes everything from lane departure warning – which alerts the driver if the vehicle is drifting into another lane, forward collision alert – which alerts the driver if they are following a vehicle too closely or if a crash is imminent, a high-tech safety alert seat – which will vibrate if a potential hazard is near, an available front and rear park assist – which guides the vehicle into a possible parking space, as well as OnStar Safety and Security which features roadside assistance and stolen vehicle assistance. If you like to customize your truck to your individual taste, then don’t miss out on the accessories GMC has to offer on their new 2018 GMC Sierra 2500HD. Some popular accessories include interlocking floor liners that come in jet black, cocoa, and dune for both front and back seat options as well as utility extras like the standard locker pop-up side rails, aluminum cab-over ladder rack, and a tent you can pitch onto the bed of the vehicle. From utility, to superior interior features, to just fun accessories, this vehicle has many extras to make this GMC truck truly your own. Interested in driving the 2018 GMC Sierra 2500HD? Give your local GMC dealer a call today or visit their lot for a test drive. A knowledgeable and reputable dealership will be able to answer any question you might have about the GMC 2018 Sierra 2500 HD, and offer financing options as well as post-purchase maintenance and repairs. GMC dealerships are known for their helpful, high-quality dealerships. From superior performance, high tech connectivity, luxurious interior features, and the ultimate exterior utility for trailering and hauling, this is a truck that’s going to last you a lifetime.